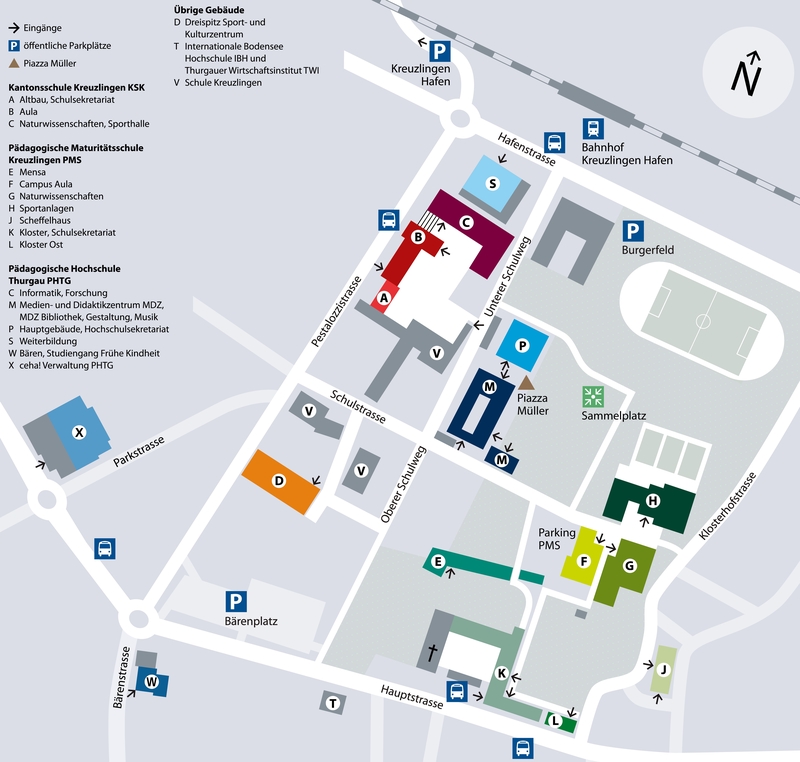 The A-Level College of Pedagogical Studies in Kreuzlingen is a state institute of education where students obtain A-Levels (Matura) and gain integrated teacher training at the same time. The teaching experience acquired at this level corresponds to two semesters at the Thurgau University of Teacher Training (www.phtg.ch) and is recognized and acknowledged by this institute. At present, there are close to 600 students at our college. Typically, the students are fifteen or sixteen when they enter the college. They are awarded their A-Levels after four years. Many of our graduates pursue their studies in education at the Thurgau University of Teacher Education, with which our college closely collaborates. Studying at the college is an enriching experience, set apart by much diversity and off-site activities. The students spend studies weeks both on and off the campus, gaining a deepened understanding of work and life in a wide variety of fields, such as theater studies, ecology, history, physics, winter sports, commerce, politics and law. Some weeks are also spent in France, England and Ireland during which the students have the opportunity to perfect their foreign language skills by attending language courses. A distinguishing feature of the college is the wide subject choice enjoyed by the students. There is special emphasis on fine arts, modern languages and music. The practical side of the teacher training is intensified in the third year with the introduction of subjects such as pedagogy, psychology and philosophy. A further unique characteristic of the college is the integrated teacher training that begins in second year and that is continued in the third and fourth years. Placements are arranged with primary schools in French-speaking Switzerland and with primary schools in England. The students can gain initial teaching experience while improving their foreign language competence at the same time. The students at the college acquire a general education. Dealing with scientific, cultural, social traditions and developments contributes to an understanding of our world and to responsible actions. A broad, general education promotes critical questioning and independent analysis as well as character formation. The range of subject matter on the syllabus is relevant for students going on to study any degree, as well as for those who choose the teaching profession. Our students obtain professional training in drawing, crafts and design and technology. They also learn an instrument. The students` own work and their varied experiences with works of art promote and encourage discussion about the question of aesthetics, form and recognizing works of art of different periods. These foundation studies equip students with the essential skills to teach these subjects later on. Especially pedagogy, psychology and philosophy develop reflection upon human existence. They contribute to a fundamental discussion about human experience and behaviour and human development. All three subjects are studied with a special view to the teaching profession. The students at the college are exposed to the reality of their future professional life right from the start. They study subjects referring to their professional training and learn the foundations of teaching and learning. They acquire the necessary professional knowledge and skills in the course of various teaching internships and practice teaching sessions. Synergy is achieved in all subjects through the content choice, the analysis of teaching- and learning processes and through methodical and didactical reflections. Teaching at primary schools, and planning and following through learning processes at the college are challenges which motivate the students to acquire comprehensive expertise, as well as to promote character formation. The A-Level College of Pedagogical Studies is housed in the former Augustinian monastery in Kreuzlingen in Northern Switzerland. The college is set in magnificent grounds and boasts impressive sports facilities, shared with the Thurgau University of Teacher Education. The cloister originally dates back to 960 in its earliest use as a hospital. The cloister has been used as a teacher training college since 1850. Continuing in the monasterial tradition of living and studying in one building, the students have the possibility of boarding at the college. Kreuzlingen is situated on the Swiss-German border, on the shores of Lake Constance which encompasses the three countries Switzerland, Germany and Austria. Kreuzlingen is a town with approximately 21,500 inhabitants and borders the university town of Constance in Southern Germany.